【During September 11th to 24th, 2010, Dr. Rayleigh Ping-Ying Chiang, M.D., M.M.S., headed for Europe for giving speeches and seeking for opportunities of international cooperation on researches of Sleep Technology. 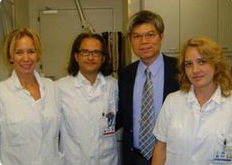 In this tour, Dr. Chiang visited Barcelona in Spain, Lisbon in Portugal, University of Lausanne in Swiss, and Århus University in Denmark. In addition to get to know the general situations on research of European countries, he also acquired many opportunities for research cooperation with EU. He began his tour in Spain for attending the publishing meeting for the publication of the first book on Sleep Technology field, Introduction to Sleep Technology, with Dutch publisher Springer. 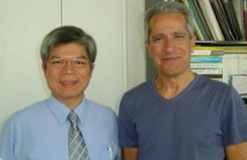 The book is edited by Dr. Rayleigh Ping-Ying Chiang and Prof. Shih-Chung Kang by inviting 23 masters from 6 countries and will be published in summer of 2011. Sleep Technology is a relatively new field to the researchers. From this point of view, the book would be definitely regarded as a pioneer. It would bring a lot of benefits and become a useful reference book for the physicians, medical specialists and researchers for sleep disorders, clinical psychologists, engineers, architects, interior designers, science and technology administrators, industrial designers, and those who were developing products of sleep technology. The second stop, relatively longer than other stays, was Portugal for his attending the biannual meeting of European Sleep Research Society (ESRS), a non-profit international science organization. It aims to promote the idea of Sleep Medicine to the world and also provides a platform for clinicians to share the clinical and research experiences with each other. During the meeting, he had gained a lot by exchanging the opinions and thoughts with the masters in the field of sleep medicine, such as Prof. Claudio L. Bassetti of Zurich University Hospital from Swiss, Prof. Pokka-Heiskanen of University Helsinki, Prof. Dieter Riemann of University Freiburg from Germany, Prof. Thomas Penzel of Charité - Universitätsmedizin Berlin from Germany, Prof. Wirz-Justice of University Basel from Swiss, Prof. Van Someren of Vrije University Amsterdam Medical Center from Netherlands, Prof. Jean Kriege of University Louis Pasteur from France, also one of the authors of our book on Sleep Technology, and Dr. José Haba-Rubio of Centre Hospitalier Universitaire Vaudois from Swiss. The third stop was University of Lausanne in Swiss, which is ranked 13th in the best colleges of the world. This university provided a wonderful environment for research. One of the research buildings, Le GenoPode, is especially for doing the gene related-researches. The Switzerland government has done a great job by integrating the resources,providing enough funds and the most advanced equipment, and gathering top talents. “It’s just like heaven for researchers there!” said Dr. Chiang. 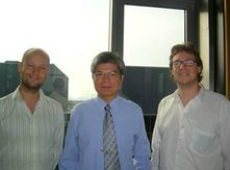 One more anecdote worth being mentioned happened when Dr. Chiang just arrived Univeristy of Lausanne. many researchers were celebrating for the submitted paper being accepted by the journal Nature Neuroscience. Usually they published around 10 papers on the high impact journals every year. The last stop in the tour was Århus University in Denmark for an invited lecture. There was aPervasive Health Center which aimed at doing researches on health issues from a variety of viewpoints of academic fields. This center has been famous for doing researches on the elder and integrated the fields of computer engineering, space designing, psychology, rehabilitation and etc. Presently, this organization was going to collaborate with INSIGHT Center of Natinoal Taiwan University for developing the research on sleep technology. Dr. Chiang brought fruitful gains from this tour. The research plans under mutual discussion are: The first one is with Århus University, Denmark. It is to find out the relationship between pillows and the light and generate the protocol of the sleep environment. The other one with Charité - Universitätsmedizin Berlin in Germany is to build Sleep Models. It was composed through complex analysis by analyzing several parameters, such as sleep scheduling, circadian rhythm, sleep physiology, light, and also cultural and educational background, … etc. It would be very blessing to collaborate with Germans since they are usually logical on thinking process of research. Charité - Universitätsmedizin Berlin is the medical school for both the Humboldt University and the Free University of Berlin. More than half of the German Nobel Prize winners in medicine and physiology came from the Charité. It was obvious that research and academic activities there were very pervasive and popular. 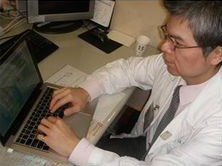 Furthermore, Dr. Chiang was invited to write a review article by the top one journal on sleep medicine, the “Sleep Medicine Review” on “neuropathology of the upper airway in sleep apnea”. The other good opportunity was for Dr. Chiang to launch a new journal on sleep technology with internationally well-know scholars. We all hope that would come true.